Veneto is a region in north-eastern Italy, with its capital in Venice. It was an independent republic for nearly a thousand years from the 8th century up to the year 1797. Venice - with St. Mark's Square, the Great Lagoon, the gondolas on the Grand Canal, Venice's Carnival together with great architecture, artistic masterpieces, particular narrow streets, canals , the Biennale art exhibition and the Venice Film Festival. Padova, the ancient and learned city with its old University, its botanical garden (a Unesco World Heritage Site), and the Basilica del Santo that houses the relics of Saint Antonio which is one of the major attraction points for millions of pilgrims every year. Verona - The city of Shakespeare's Romeo and Juliet and a Unesco World Heritage Site. Rich in history and heritage dating since the roman times such as world-famous roman Arena. Vicenza - the city of Palladio and a World Heritage Site. Home to beautiful Renaissance buildings such as the world famous Villa la Rotonda and the oldest covered theatre in the world Teatro Olimpico. Treviso - less known but still a very charming medieval town with some canals and great art and architecture. Rovigo - small but quite pretty city centre, overlooked by many visitors. Belluno - small town located at the doorstep of the Alps, a good starting point for mountain trekking. Palladian Villas - a Unesco World Heritage Site comprising many Renaissance villas built by the famous architect Andrea Palladio and scattered throughout the Region. Dolomites - a spectacular mountain range covering the northern part of the Region, a perfect place for skiing and hiking and also a Unesco World Heritage Site. Cortina d'Ampezzo - located in the province of Belluno. A place with spectacular views of the Dolomites where you can relax and walk in the summer and ski in the winter. The Olympic Wintergames in 1956 helped it become a city known around the world. Lido di Venezia 10 minutes from Venice, the golden beach and summer retreat for many Venetians. Bibione - seaside town popular among locals and tourists. Jesolo - large seaside town close to Venice, popular among italians and foreigners. Offers a good nightlife with famous clubs such as Il Muretto. Lake Garda - the largest italian lake, and a well know tourist destination with many medieval villages and castles overlooking its shores. Veneto's main airports are Marco Polo airport in Venice, Antonio Canova airport in Treviso, and Verona Villafranca airport (also known as Valerio Catullo airport) in Verona. Venice - It is one of most famous and visited cities in the world. Dolomites - A beautiful mountain range stretching along the regions of Veneto, Trentino-Alto Adige and Friuli-Venezia Giulia. Get a map of Venice with the water bus routes. You can see major parts of the city just by getting on and traveling the canals around the major islands. Just sit in St Marks Square and watch the pigeons, listen to the music, and watch the people go by. The Venetian glass is beautiful. Be careful about the time of year you go to see Venice. It is under water some times. Planks are put out to walk when the sidewalks are not walkable. If you go the right time of the year, it is a beautiful city and well worth the trip. Find a website that actually has some information on what to do, not just idle observations and activities that you can do anywhere. Veneto's cuisine features a wide range of styles and dishes. It is quite different from all the other regional cuisines of Northern Italy and has a few things in common with austrian and eastern Europe's cuisines. It can be roughly divided into three main categories: coastal, the plains and countryside in general, and mountains, but keep in mind that there are many other local cuisines and each province has its own typical dishes. Along the coast seafood is very popular, especially around the Venetian Lagoon where you can find fishes from the sea, the lagoon and the many rivers that run through the area. The plains and the countryside are the place for grilled meat (pork, beef and chicken) together with grilled polenta, potatoes and vegetables. It's the typical cuisine of the many local sagra (town festival) held throughout spring and summer. Polenta is found almost everywhere in Northern Italy and in some areas of Central Italy: it is basically boiled corn and once it was one of the main (or the only) dish the poorest classes could afford. You can eat it hot as a porridge or grilled. Among the most popular dishes there is risotto, which is rice cooked with many different kinds of food: there are many local specialties to try depending on the season and the town or province you're in. Up in the mountains and hills the cuisine features pork, beef or game meat, with polenta, as well as mushrooms or cheeses (usually made by cow milk), and some dishes taken from Austrian and Tyrolese tradition. Veneto is one of the biggest wine regions of Italy. Here many DOC (Denominazione di Origine Controllata in Italian, means controlled designation of origin) and DOCG (Denominazione di Origine Controllata e Garantita in Italian, means controlled and guaranteed designation of origin) wines are produced especially in the provinces of Treviso, Venezia and Verona. On the hills above Treviso, around the town of Conegliano there are many wineries producing Prosecco. 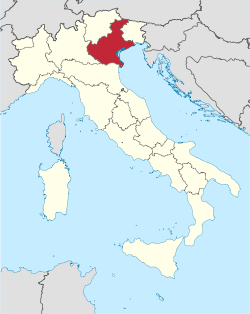 Other winemaking areas are to be found on the plains close to the coast, the Venetian Lagoon and along the Piave river. Another famous wine area is close to Lake Garda. It's no surprise that one of the largest wine shows in the world, Vinitaly, is held in Verona every April. This page was last edited on 6 March 2019, at 14:13.